I still feel like I haven’t processed the November election fully. It was full of so much for me. So many wins and so many losses, I almost don’t know how to feel. I promised myself about two months ago that I would take time to sit down and reflect on my experience by writing about it, but I quite literally couldn’t find the words to articulate how I felt. I still can’t. But I’m going to try. 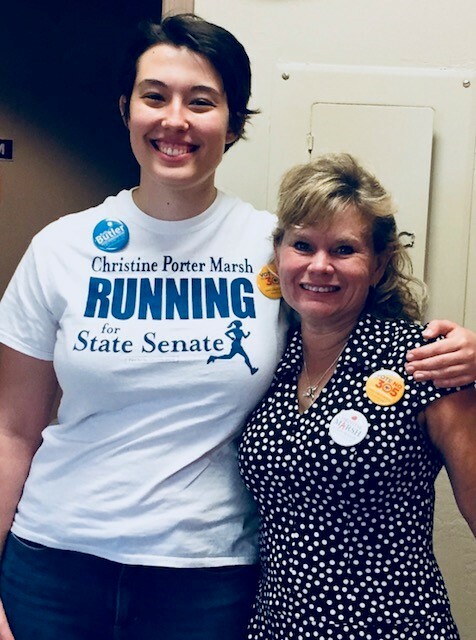 I got involved in the 2018 midterm elections because I wanted to help my teacher run for office. I was an activist who had done great work before but wanted to expand my horizons. I was extremely scared to start working on a campaign. I have always struggled with severe anxiety, and, on top of that, I had a hellish senior year where I lost my sense of community and fulfillment. To be honest, I had no idea what I was getting into when I started this work. Me and maybe 5 other kids were part of the intern program that had just started in LD28. We went to training in a small office space in downtown Phoenix and all crowded around a table as an extremely enthusiastic and kindhearted blond Afro haired man told us all how this would change our lives. I didn’t really know what to think at the time. Something just told me to stay. The next six months would be some of the most grueling of my life. I was volunteering constantly in an unfamiliar field doing unfamiliar tasks, most of which consisted of talking to strangers, which I was already uncomfortable with. All while balancing my senior year and mental health issues at the time. I faced blatant and implicit sexism and ageism on almost a daily basis, and would later have to deal with queerphobia. To say it was an easy ride for me wouldn’t be telling the truth. But this was also one of the most valuable and most incredible experiences of my life. I remember that scared girl that started out in February. Now she is a strong confident woman. She always was, but she needed a little bit of help finding that out for herself. The campaign gave me a confidence and an independence that has been a revolution from within. It gave me an ability to find common ground with people who I would have otherwise never found common ground with. It helped shape my entire career path. Campaign work is my calling, and not only do I plan on working on other people’s campaigns, but I also plan on being an elected official someday. The most priceless gift that the campaign has given me, one that I had not seen coming, was a family. I went through a traumatic year and felt like I had lost all sense of community. And then it just showed up. To all of my LD28 people: thank you. You have been there for me in ways that you could never know, and I truly love and appreciate you all. We have seen each other through an experience that only we could understand, and I know our time together is certainly not over. I won’t even name names because there are too many of you. We had some incredible wins (congratulations Aaron and Kelli!) and a devastating loss but I hope that you all believe that the work we did changed Arizona for the better. To everyone that voted, volunteered for and/or donated to our candidates: thank you. Your contributions, however small or large they were, don’t go unnoticed and have made an impact that I don’t think we can even fully see yet. To all of the organizers and volunteers: Arizona got better because of you. 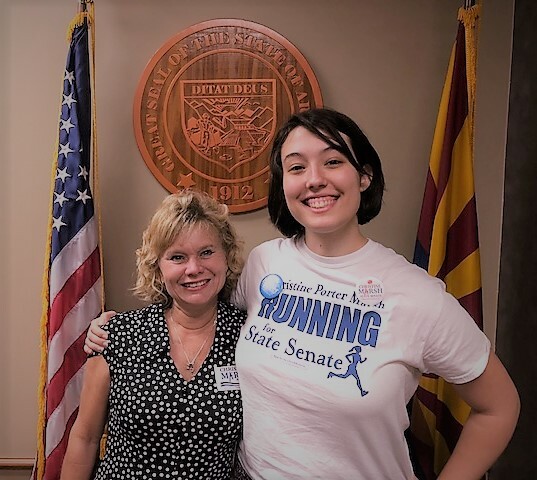 Because of you, we elected women to positions that had never seen them before, we elected Democrats, we elected teachers, a bisexual senator and turned a once die hard red state purple. Millennial voter turnout increased by over 200%. Whether you won or lost the specific election you were fighting for, your work was invaluable. To Democrats: as my friend Tommy once said to me, we need to do an autopsy and not a cremation. Everyone has various privileges and powers that they hold, and I ask that you all consciously and seriously reflect on the things you did well and the mistakes you made this past election. The bias that I experienced should not be happening in a party that calls itself progressive. And still I have a lot of privilege. Our world is changing, yet there is still old disparity in the people that get paid (straight cis white rich men) and don’t get paid (everyone else), that are in positions of power (straight cis white men) versus not (everyone else). Whether you were a volunteer, staffer, campaign manager, candidate, donor or voter, I ask that you look deep inside of yourself and see how you will do better next time. And then follow through. I will be doing the same. To Ms. Marsh: Fighting for you and beside you was the honor of my life. I don’t know what the future holds for the both of us yet, but I know that it will be great. Thank you for being my mother, my mentor, my champion and my hero. And lastly, to me: You are amazing. You are beautiful and wonderful and intelligent. You have inspired so many people and changed so many lives and will continue to do so. Your work on this campaign and on the future of Arizona was invaluable. You are a force to be reckoned with. I hope everyone has taken some time to rest. It’s needed and well deserved. I will be back on my feet, up and running, ready for the next fight in no time. I hope you’ll join me.